Essay series thesis: Many of the traditional myths about Yellowstone National Park are not only false, they are far worse: They point to ideas that are wrong about society at large, reinforcing exploitation and disempowerment. Nevertheless, Yellowstone lends itself well to myth; we should consider new ways to celebrate this magical place. Read Part 1 and Part 2. Part 3 explores things to consider when myth-making about Yellowstone. If the old myths fail in large part because they set people over each other and over the environment, the new myths must avoid that while at the same time being experientially relevant to us as people who tell and hear these stories. What's more, the new myths cannot stand alone; any sound myth about Yellowstone must admit up front that it falls short - that it's leaving out and therefore point the way for a new space where we can have a new set of experiences, stories, and myths. Even as Yellowstone - as we know it - lasts over moments that will pass into volcanic oblivion, so too should our stories leave open and encourage others to share in our space. There are stories not often told about Yellowstone, and even the ones I can share are not the stuff of myths. 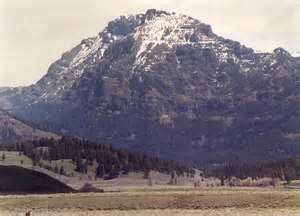 In 1993, I became acquainted with Yellowstone for the first time, most of which you can read about here. What does it mean to say that? For me, on the one hand, it meant I was in the political space defined as Yellowstone National Park. It meant seeing the Old Faithfuls, the Grand Canyon of the Yellowstones, the Tower Falls, the Mount Washburns and Avalanche Peaks, the buffalo, and the elk. In that respect, it wasn't any different than the innumerable and often quite tedious trip reports that we see all over the blogosphere. For me, though, if you reduced my summer in Yellowstone to the sights and animals that I saw, you would have missed out on so much of what actually compelled me to embrace Yellowstone. You would have missed out on Price Roberts, the Young Romantics, Reuben's reubens, Jay Clayton, the greater Yellowstone wanderings (especially that year into the Tetons), crazy Monday nights, explorations into religious faith, and the discovery of hackeysack. Increase the years, and what was Yellowstone to me both expanded and changed. It became "the sublime;" "the magical;" the land of my first kiss; Rainbow Gatherings; the infinitely diverse; the land of my honeymoon; the land of beautiful co-workers and disgraceful tourists; the 50 ways to see Old Faithful; the land where Steamboat Geyser erupts (for me); Venus on Earth; the lands of incredible pendulum swings (high highs and low lows); a best friend; a land that embraces the forgotten; the land of chipmunks, butterflies, and stories. It became the land taken, the land where the Sheepeater and the beaver were shelved, where the lake trout became king and enemy #1, where the mystique became re-defined, where I realized just how silly all my stories had become. And, that's just a piece of it! What's more astonishing still? That's just me and only a small piece at that! Yellowstone, the place that evokes such wonder, has hardly had its wonders revealed. They rise up and recede. Think that even Old Faithful - Old Faithful! - goes on quietly often without human witness much of the year, in the darkness of night, especially during the long winter (with or without streaming video from Canon). If you think about what hasn't been seen, who hasn't seen it, smelled it, or tasted it, the story of Yellowstone seen through that light is one of whom we have seen only a glimmer. We have hardly taken the time to appreciate it and seek out its stories, so enamored we've become with the details of its founding, with its rangers, with its bears and wolves and buffalo and elk - and these only in caricature - that we have sadly missed out on the depth and immensity of the beauty before us. How easy it is to find a call to action to save a wolf or a grizzly bear, to find some apocalyptic post talking about the Yellowstone supervolcano! How hard it is to wonder what that mosquito was doing on DeLacy Creek, what happened to that pine cone that dropped to the forest floor, and what people and beings will never be able to wonder about such things. Let me share one insignificant story to shed a little light. However, note this first. The story's insignificance is crucial to understanding my point! I am not here to write the new myth; it's not mine to write, not even one myth. This here is but a provocative bite to make us wonder about what else we aren't wondering about - a wondering we without question must welcome as we work through our wondering, wandering myths on Wonderland. My third summer in Yellowstone, 1995, was an unusual one in the respect that I had just started a relationship with the woman who would become my wife and later my ex-wife. We honestly decided that we were a couple just hours before I took a Greyhound bus from Spokane, WA, to West Yellowstone, MT, to start my summer in Grant Village. It was a summer that my roommate from the past couple summers, my dear friend Price, was no longer there. I was no longer with A Christian Ministry in the National Parks. In many respects, it could often feel like I wasn't there - without a car, without my closest friends, with my heart in another place worried about a new relationship. Yet, this didn't mean that I refrained from being social. Unlike other years, I didn't seem to click well with any of the younger people in Hamilton Stores. It's not that I didn't get along with them - my roommate Nathan was a fine enough of a person and another philosophy major to boot - it's that it didn't click. The previous year I had made so many friends at TW, which I think by 1995 was now run by Amfac (which then changed its name to Xanterra). I found myself hanging out at the dorms there a lot, playing ping pong, hackeysacking, making the occasional friend. One man, whose name I don't remember, took an interest in me. He was a Native American, but I couldn't even tell you the tribe. For whatever reason, he told me that he needed a friend and wanted me to be his. However, for whatever reason, I must admit that I wasn't that interested. The overt frankness was not something I was used to, and I didn't know what to make of someone so seriously telling me that he wanted me to be a friend. Even so, we'd hang out sometimes, and he took me to a special place to him, a tipi that had been constructed out in the woods of Grant Village. This was not an archaeological find; it was a brand new construction. I'm not sure who put it up - it was out near the water tower. I remember feeling underwhelmed; in all honesty, I wanted to appreciate it, but I didn't understand. In the Amfac dormitory, there was a bat living in the lobby. An area was set around part of the dorm blocking it off. Bat droppings can be toxic; since the Park Service was not going to remove the bat from inside the dorm, we all lived with this unusual restriction. I feel like I remember that much more than details about the man who tried to befriend me. And, of course, I remember that much more being spurned by a young woman who I thought was my friend that summer. I may be mixing up details; especially the timing of the bat droppings, the location of the tipi, and so many other things. I guess the thing that I wonder about in my stories in Yellowstone is what I'm not telling about. Do you have any idea how many other stories were happening in the very cracks of the dormitory walls? We tell stories that seem significant to our lives, but the stories that express Yellowstone can only be in pieces and not terribly interesting. What I've just shared is not one that is commonly shared, and yet there's significance people will draw. Some people will know how passionate I am today about indigenous issues, how I continue to learn and learn (this is the first time in three years that on Columbus Day I have not hosted a teach-in drawing attention to the genocide.) Some will know where my life is now, knowing that I am perhaps writing on the day that a child will be born to me (if not now, within the week), though with someone who was not with me in Yellowstone in 1995 (but rather 2005). Some will know that I have a soft spot for the forgotten animals; some will see in it a mild praising of the Park Service for allowing that bat to live in that dormitory. Yes, yes, yes, but don't miss the point. I can't write a myth about Yellowstone. I don't know if someone can, but it's not mine to write. My perspective is too unilaterally mine; it's not the Yellowstone myth. It can only point the way to those who have stories to tell. The deficiencies of the stories we have looked at about Teddy Roosevelt, about campfires, about Christmas, and about Jellystone, as well as the stories I have to share, are mythically deficient in too many ways. Somewhere out there I hope there are great Yellowstone stories that somebody can share. One of the paradoxes that seems to be coming from these essays is that no human is capable of expressing the sheer majesty of Yellowstone, and yet there is an inexplicable call to share stories that shed light on this place. What's more, Yellowstone's infinity is only barely the story of humans in Yellowstone. While some humans have been written out of the story inappropriately, we cannot emphasize enough just how infinitely complicated any place is potentially. Yellowstone exceeds all places I have experienced in that respect (and how one infinity can be greater than another - oh dear - have we slipped into discussing my dear friend Leibniz? - you see, I am hopeless.) So, the human place in the story is small, if we are considering sheer numbers of possible stories. And, yet, as humans, no story can be told without recognizing that the storyteller is going to be human. And, no human seems capable of living without other human interaction. The human place in our stories will always be larger than the place we recognize as much bigger. Perhaps, myths about Yellowstone are impossible? However, that's not what we should conclude, anymore than people can stop speaking truthfully about the universe. The point in myth-making isn't that we create a story that has everything in it but that we have a story that can acknowledge its humble place in the whole. It can see what it isn't. The old stories we have about Yellowstone are champions of vanity in at least some respect. They all fail to appreciate the context; own up to what they lack. To think that anyone can just give us Yellowstone, to control something as grandiose as Christmas, or to turn Yellowstone into the patronizing myth that is Jellystone is sheer foolishness. Yet, do our stories need to be that way? I don't really know how to tell stories that I think meet the test of humble truth so required of us, but I cannot see why someone else couldn't share those kinds of stories. What keeps someone from telling those stories? I can't possibly say whether the people I have met along the way can; it's perhaps too romantic to hope that to be the case. Yet, somewhere, there are stories that honestly portray the relationship of the storyteller to Yellowstone that also helps us all see something about this place. With or without myths, we all have something to share. It remains a wonder to me why so few of the millions of people who go to Yellowstone every year share their stories. Of course, most people do not feel the need to make those stories public. Nevertheless, even then, the percentage of stories is so small. Whether a story rises to the level of myth is not so important as it is that people feel as though the stories from their lives are not insignificant to share. We don't need to be Teddy Roosevelt, we don't need to be Nathaniel Pitt Langford, a park ranger, a great politician, or even a very able writer to share something of significance in our experience. The stories shared are so few relative to the number that exist that it's hard for me to believe that there's not some deep social anxiety behind it. How much do we fear our peers? How disconnected are we from each other's stories and lives? How well do we know our families, our parents, siblings, and children? How well do we know our colleagues and even some of our friends? Putting our stories about Yellowstone out there is scary because we have often not figured out how to do so with people who we think should be closest to us. What is it about a place that evokes so much that still keeps people so predictable or tight-lipped? Might the past stories shed some light on that? I have argued that I think they do. They tell us wrongly that great men make history, that the grander is the better. Even in an age like ours that embraces reality television and where almost everyone seems to have their own blog, we don't seem to know how to tell our stories, much less figure out anything about how our stories fit into a picture, much less say anything that seems to be mythical (i.e., truthful)? Perhaps, the myth needed about Yellowstone is the shared tale, not told by one storyteller, but communicated by people talking with each other, much like the way oral traditions were once passed along. In an age where some write, some post videos, some post photographs, and many just take in what others do, we still lack a sense of community. Where is that Yellowstone community that can share its tale? It might have been the Sheepeaters before they were cast aside; it might today be the workers, but the seasons make their stay very temporary. It has sometimes been the administrators, but their stories have grown stale. And, yet, so many of us have been so touched? Are the stories lacking because of something in the national park idea itself, or greater yet - in the idea of the industrialized nation -, or perhaps greater still - in the idea of civilization - that keeps it from happening? Those are weighty questions, but the only way to break the force of them is to speak out. If the myths of the past tended to disempower; we can only be empowered if we share no matter the story we have to share. I would love nothing better in my life to be a facilitator of tales rather than a teller of them. That would be quite the tale to tell! Of course, if facilitating stories is too grand an ambition, then I'll humbly share my silly stories as well. There's little else for me to say on this issue. I have spoken enough to make my point. While we need to be wary of Yellowstone's past myths, we should not fall into the trap of preferring history to myth-making. Myths, when told well, always point us to the truth. However, Yellowstone's most popular myths have actually tended to reinforce falsehoods about our relationship with each other and our world. Though we lack good myths, it would still be great to have them; however, I am hardly the person to begin writing them. My own limits as a writer and storyteller are too great to overcome. Nevertheless, there is a place for people to share myths, if only they'd tell some of the stories of that which is forgotten or hardly noticed, if they'd share their story in a context much greater than anything they share, and finally they'd share a story that comes from the sensual details of their own experience. However, even if I don't have myths to share, I do have stories. So many of you do as well. If we want to undo the damage done by our past history and the myths that arose in that history, we have to know that our stories matter. They should be shared; shared with each other. In sharing those stories with each other, there is hardly a more important or more rebellious act we can take against the past and the lousy myths with which we have been left. There's hardly a more beautiful thing we can do for Yellowstone than listen to each other and this wonderful land we inhabit, wherever we physically happen to be. Somewhere, there's a bat in a ceiling in Yellowstone thinking nothing of tipis or of geysers. However, I am, and so are you. What, if anything, do you have to share with us? Something far less than gracing us with a national park will do.